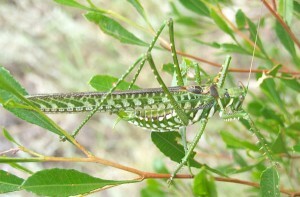 I just ran across an interesting New Scientist article on an Australian katydid that is an acoustic aggressive mimic. The Spotted Predatory Katydid, Chlorobalius leucoviridis, imitates a female cicada’s reply to the male’s song. For more aggressive mimicry fun, let me recommend, once again, Bruce Sterling’s saga of Photinus vs. Photuris: Luciferase (link is via the Wayback Machine, so formatting may leave something to be desired). This entry was posted in creatures and tagged cicada, firefly, katydid, mimicry by dr.hypercube. Bookmark the permalink.